The use of rice in these sayings demonstrates the importance of the grain in Chinese culture, and it’s been part of the Chinese way of life for, probably, thousands of years. Archaeological evidence suggests that rice was first cultivated in Korea as long ago as 4,000 B.C. From there it spread northwards to China and gradually out to the rest of the world. Place 1 cup uncooked long grain rice in a sieve and hold under running water to rinse out some of the starch. Place the washed rice and 1½ cups water in a saucepan and bring the water to the boil. When it’s boiling turn down the heat to medium-low and put the lid on. Leave the lid off slightly to allow steam to escape. After a few minutes when the level of the water has gone down, reduce the heat to low and fit the lid tightly on the saucepan. Simmer for another 15 minutes or until all the water has been absorbed. 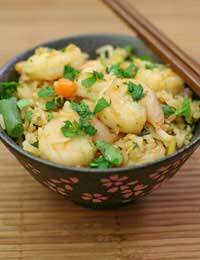 Using a fork, fluff up the rice and serve.For fried rice, boil the rice the day before if possible. Spread it out on a baking sheet and allow to dry thoroughly. Break up any lumps with your fingers. Mix the eggs with the salt and pepper. Heat some oil in the wok. Add the egg mixture and cook lightly, stirring. Remove from the pan and set aside. Wipe out the pan and then add a little more oil and stir fry the spring onions, red pepper and peas for 2 minutes. Add the cooked boiled rice, stirring well to separate the grains. Add the soy sauce and scrambled eggs and heat through. You can vary the vegetables to suit your taste and what’s in your fridge. For a meal in one dish try Chicken Fried Rice. Use the same basic ingredients and method as above but add 8 oz diced cooked chicken with the rice. Stir well. Add 1 tablespoon oyster sauce along with the soy sauce. Make sure it’s all thoroughly heated before serving. Instead of scrambling the eggs, cook as an omelette and serve sliced as a garnish on top of the dish. Heat some oil in a wok. Add the garlic, ginger and chilli and stir fry for 30 seconds. Add the onion, pepper and carrot and stir fry for 1 minute. Add the prawns and pineapple. Stir. Add the rice and stir thoroughly to separate all the grains. Cook for 2 minutes then stir in the soy sauce, curry powder and sugar. Mix well. Serve garnished with chopped spring onions.